beautiful permanent keepsake of your 40th Reunion and of your Class' Monuments at West Point. "One of the few class’s selected for examination by the Official West Point Bicentennial Book as 'one remarkable class', the Print "Strength And Drive" carries the symbols and personal signatures of four of '65' class members' greatest achievements: MOH; POW; COS and USMA Supe." I was honored to be asked by the Class of 1965 Historian Ross Wollen to create a Memorial Print for the class 40th reunion that focused on the Class's Bicentennial Gift of the Thayer Walk Forum and its 40th Reunion gift of the new Entranceway to the Cadet Gymnasium, named for Classmate Bob Arvin. I made dozens of visits to West Point studying, photographing and sketching those monuments and other sites important to the Class such as its Vietnam era section of the West Point Cemetery and the South East Asia Bench and Headstone, by Lusk Reservoir, dedicated at the 15th Reunion. As I researched your Class, I learned it was the only West Point Class selected for examination by the Official USMA Bicentennial Publication as "one remarkable class". 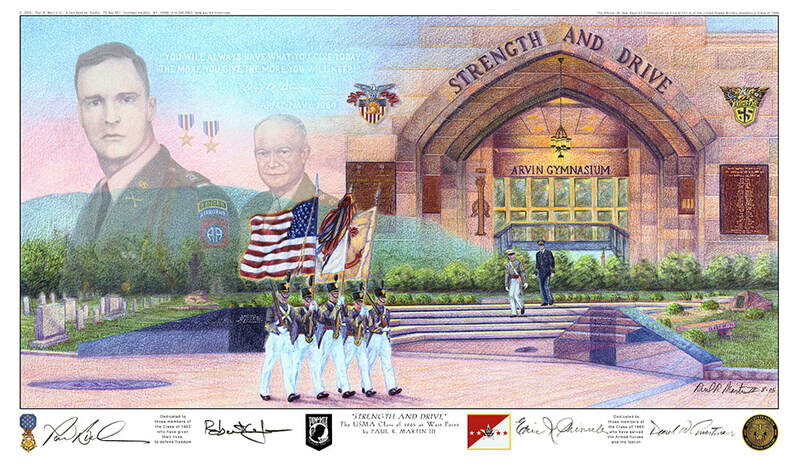 We sought to recognize that distinction by adding, at the bottom of the Print, the special symbols and personal signatures of four of your most distinguished Classmates: MOH; POW; COS and USMA Supe. I was honored to meet each and thank them for assisting me. After several sketch revisions, I developed a composition incorporating many images of significance to the Class of 1965. The newly dedicated Arvin Memorial Entranceway creates the main focal point of the print. It includes the three new Plaques unveiled at your 40th: The story of Bob Arvin's two Silver Stars; the Class members lost in service to their Nation and the Telegram from Ike which inspired the '65 led Army Football Team to beat Navy (and Roger Staubach) in 1964. Also included are the Academy and Class Crests, of course S&D, and the 1965 Corps Squad "Major A" Scroll, which still resides in the "old gym". The '65 Thayer Walk Forum and surrounding landscape envelop the rest of the composition with a montage of several other elements enhancing the work. Note the Class SEA Bench and SEA Memorial Stone and Tablet to the right, and the Vietnam Class section of the Cemetery on the left. Patton's statue is pictured looking over the Forum and Class Tree before all were recently removed to make room for the new Thomas Jefferson Library. Below the archway in the distance is Trophy Point's Battle Monument, and to the left, behind Patton, is a distant view of Quarters 100, where Dan hosted a reception for you at the 35th. In the margin below, I have repeated the dedication inscriptions from each side of the Forum entrance. After having the privilege of speaking to many of you at your Reunion, I decided to add three images of Bob Arvin. Echoing the wonderful '65 HOWITZER Gatefold which shows him as First Captain in Cadet Gray and then as a newly minted Second Lieutenant in Army Dress Blue, your Cadet Leader is walking down the steps of the Forum, toward the Cadet Color Guard, symbolically placed below his name on the gym. With the great help of Tom Fergusson '65 and Chuck Moseley '65, I included an image of First Lt. Arvin above the '65 section of the West Point Cemetery, rendered from a black and white Fort Bragg photo of the 82d Airborne-Ranger taken just before his deployment to Vietnam. The two Silver Stars soon to be awarded posthumously to CPT Arvin float above his shoulder. Symbolically looking over Bob's shoulder is GA Eisenhower, whose Great Class of 1915 attended your graduation and shared many similarities with the 50-year younger Class of 1965. Faintly and ephemerally rendered are his inspirational words, etched gently across the heavens, which now greet Cadets entering Arvin Cadet Physical Development Center. It is with great pride and honor that I accepted Ross Wollen’s request to create this special print to commemorate the USMA's Class of 1965 40th reunion. It is my wish for "Strength And Drive" to pay fitting tribute to this extraordinary Class, and all their accomplishments in the service of our country.